UESP Forums • View topic - UESP Forums Mobile Template! 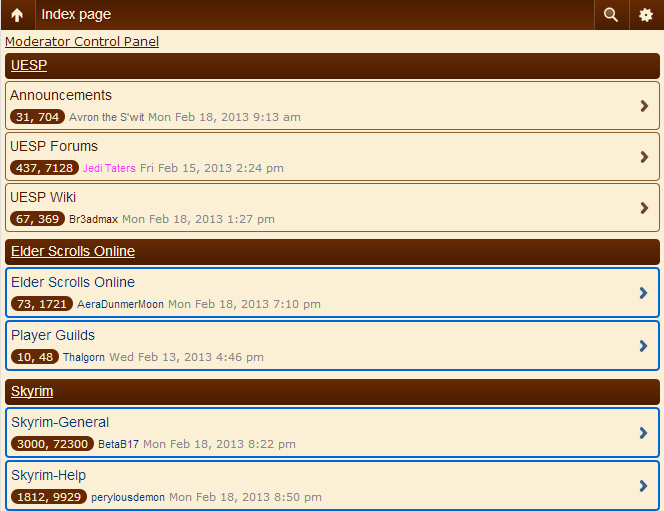 Post subject: UESP Forums Mobile Template! Announcing the UESP Forums Mobile Template! There is a bit of a learning curve to the new template, so I'll be posting some screenshots and a few instructions on how to get around. Huzzah! You don't have to do anything to switch templates if you're on a mobile device! Plus there is a button on the bottom of the page that lets you switch to the full version if you prefer it! To get around you have two options. 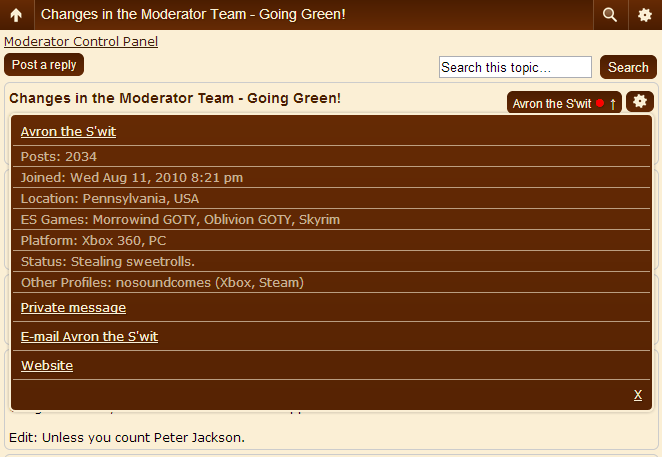 At the bottom of he page is a quick list of every sub-forum. In the top left corner is an arrow button that when you tap will give you a backtrack list of the forum you're in as well as a link to the Wiki and Chat. In the top right corner is a magnifying glass button that gives you search options including new posts and active topics. To see your PMs and User Control Panel tap the top right gear icon! 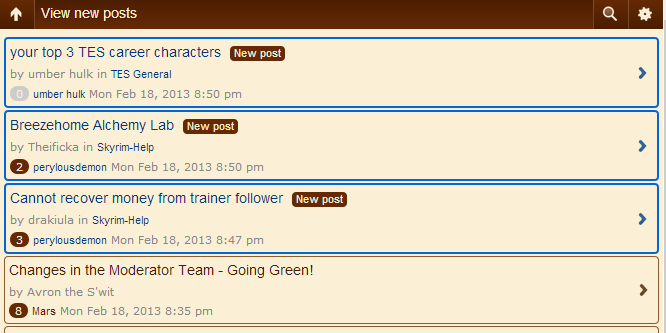 Forums with new posts are highlighted blue for your convenience! Tap the New Post bubble to go to the latest post! New posts have a little orange page next to the title. Online people have a green dot, offline people have a red dot! Anytime there is an arrow it means you can tap it to get a menu. Well that just about does it! 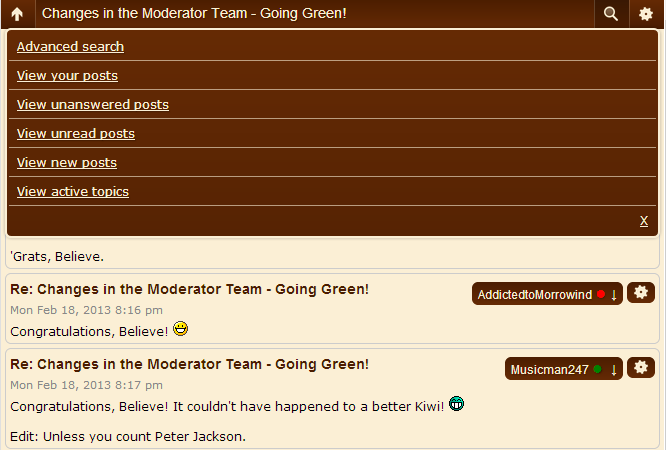 At the very bottom of the page are links for the Board index as well as the Who Is Online page. If you have any questions, drop them here! 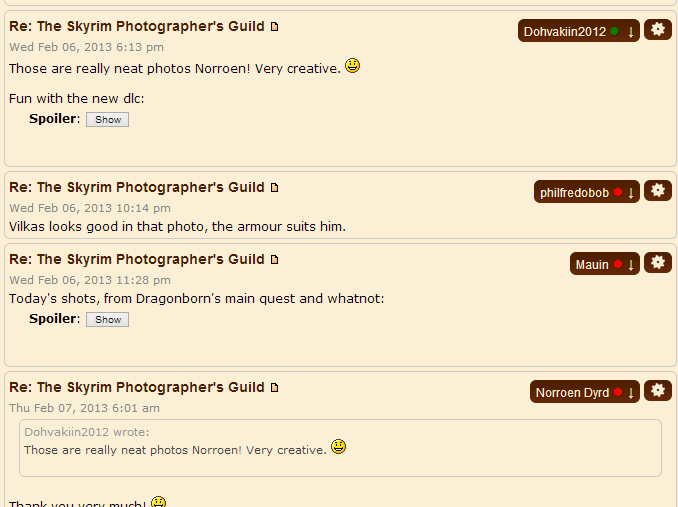 Post subject: Re: UESP Forums Mobile Template! I've been on my mobile since I've been back and I was looking through then refreshed and I was like "woah o.o what did I do.." Haha I like it. I could be wrong but it looks like the format had some minor changes since I tried it a week ago. From what I've experienced I like the template quite a bit. Thanks for putting this into effect so quickly. I'm impressed. Working well for me so far, and seems to have improved loading times, so kudos. Might take a bit of getting used to, but looks good. Whoa, I came here on my ipod just now and was surprised to see the change! My only suggestion is adding the user's avatar on a post, even if it's small. That more than anything helps me identify users, and it's hard to remember who's who just by the name. Part of using the mobile template was in trying to reduce load times. Adding avatars would cause load times to go up, which for some people isn't a trade they'd be willing to make. It could be done, but I'd have to hear from more than one user on the issue. For me it's not about the load times but the look. I feel the mobile template would look really crowded on my phone if avatars were added. If you did add them in I'd likely exercise the option to suppress avatars while mobile browsing. Is it possible to have the mobile template default with avatars suppressed, with the option to activate them? I would have to look into it, but I doubt it. The mobile detection doesn't change anything in your Control Panel. I use an iPhone 4 and the mobile site looks and works really well on it. I'd rather not see anyone else' avatar if it slows down the loading times. Other than that I have no complaints. I can see myself getting used to it, but certainly not for the next few weeks. It will definitely require some getting used to, but I think it'll work. I'm fine with leaving out avatars and all that. Haven't signed in using it yet but I do like it for mobiles more than using the normal version which takes far to long to load. Nice job. It was in the OP, but I guess the instructions are easy to miss. I can't seem to find the link offering to go off the mobile template... Is it under the cog or elsewhere? It should be at the very bottom of the page. All the way down. I cannot see it then, if it should be at the bottom of the page. Nexus seven. I think that could be way however..
Nope, I'm on Nexus and I was switched to Mobile mode. I've switched back and forth twice. See if that lets you stay in desktop mode. If so I'll manually add a link to the bottom. Yep it allows me top stay in desktop mode, and I can see the switch to mobile option down at the bottom. Guess it isn't friendly with jellybean? That's possible. The Tom said he couldn't see the button either. I'll add the link to the bottom tonight. I see the option now, odd, I guess it didn't load right in the code or something? I think there should be a new post bubble option for read posts.